LATEST UPDATES AT TOP OF POST. Updates on Muqata Twitter. Prime Minister Salam Fayyad said "the attack was in contradiction with the national interests of the Palestinians and the PA's strategic vision". 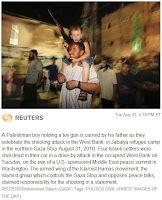 Palestinian Authority President Mahmoud Abbas said "condemns all acts that target Palestinian and Israeli civilians." and the attack in the Hebron attack was designed to "disrupt the peace process. 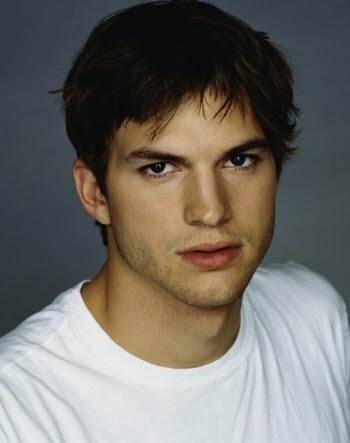 and can't be regarded as an act of resistance." Not one word from them that it was actually terror and morally wrong. By the way, anyone see any Palestinian civilians murdered by terrorists last night that Abbas is condemning that act? 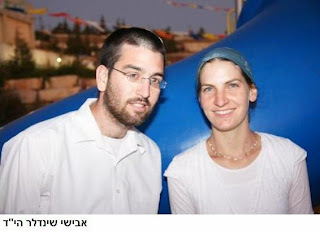 Avishai Shindler: Today was his 1st wedding anniversary. 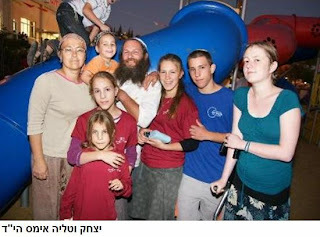 Talia and Yitzchak Aimes left behind 6 orphans (ages 1.5 - 19). Kochavia Even-Chaim left behind a daughter (age 8). Victims names: Yitzchak (47) and Tali (45) Aimes, Kochavia Even-Haim (37) and Avishai Shindler (24). One of the victims (Shindler) was originally from Elad. 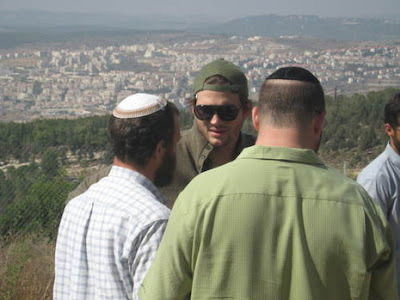 He moved to Beit Chagai after he recently got married. 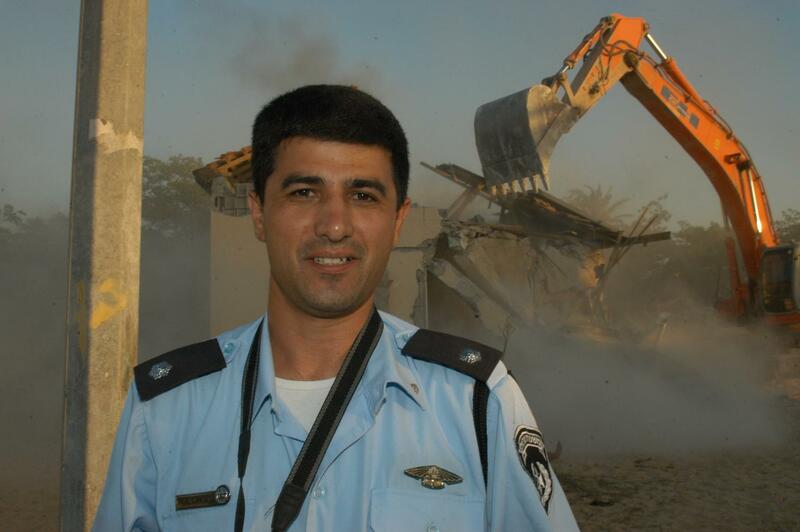 ZAKA volunteer who went to the terror attack to assist, discovered that his wife was one of the murdered victims. Hamas says that this is the first in a series of attacks. Ehud Barak: "The terrorists wanted to hurt our government's policies" (sounds like a variation of "the price of peace" and "victims of peace"). 10:42 PM Victims were a couple, and 2 hitchhikers. 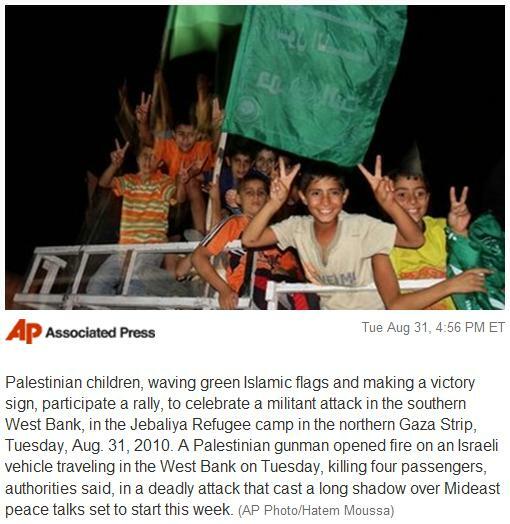 Both Hamas and Al Aska Brigade (Fatah - PA Abu Mazen's personal terror force) claim responsibility for attack. Update: Credit given to Hamas. 9: 20 PM. Just received an update from a participant in an IDF spokesman's conference call regarding the attack (thanks S who was stood in for us during the meeting which we couldn't participate in). Conflicting reports from the IDF. IDF spokesman says there were no specific alerts, despite peace talks, and this entire road was clear of roadblocks and checkpoints. Yet, Channel 1 TV reports that Chief of Staff Gen. Ashkenazi was in Judea/Samaria command headquarters this past Sunday, and warned all commanders that this region was "on fire" due to peace talks and Islamic Jihad and Hamas wanting to derail talks. IDF SP says massive amount of gunfire used to attack vehicle. Security is raised throughout country in concern for a 'wave of terror' attacks due to "peace talks". Meanwhile, reports are that the terrorists are still in the field. 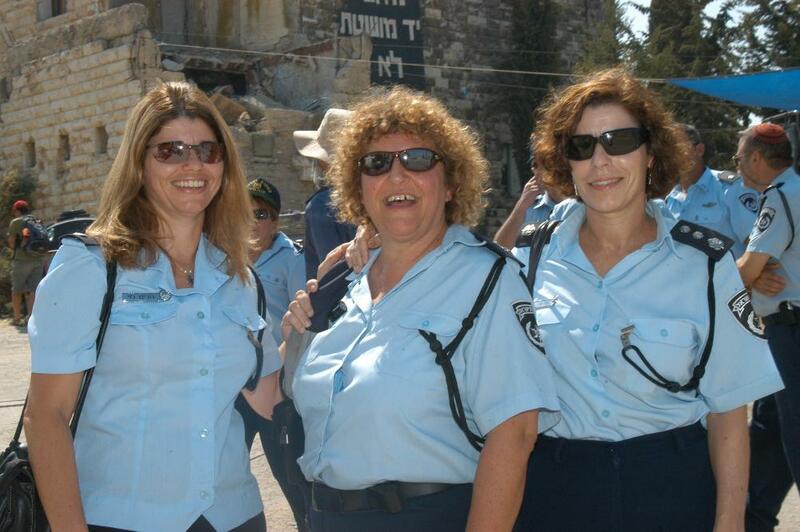 IDF has captured 3 suspected terrorists, but new reports say they aren't sure these are the terrorists. UPDATE: Not the right terrorists. The terrorists shot up the car. When the car stopped, the terrorists approached the vehicle and individually shot each victim to "confirm their kill". 4 people were just killed in a car by Palestinian terrorists. 1 of the dead includes a pregnant woman. 2 men, 2 women, ages 25 and 40. They were residents of Beit Hagai. The following video clip is an accurate representation of the volunteering I do within United Hatzalah. They didn't ask me to post this, nor are they paying me to post it. However, United Hatzalah supplies all my emergency medical and radio equipment that I use as an on-call volunteer medic, 24x7. Sorry I've been posting less, but its been crazier than usual....for the record, my time has been put to better use than blogging. I'm slowly starting to get back in the saddle. "Dating to the Stone Age, the tiny knives are believed to be at least 200,000 years old. A Tel Aviv University excavation team found the tools around a fireplace littered with charred animal bones. Archaeologist Ran Barkai said he believes Stone Age hunter-gatherers used the rough, round-shaped cutlery - ranging from the size of human teeth to guitar picks - for slicing through cooked meat because they were found next to the animal bones. The bones were used to determine the age of the knives. The number of knives found, coupled with the fact that they had no signs of sharpening, indicates they were disposable because they would have dulled after several uses, he said. The knives were made from recycled material - parts of larger knives and tools designed for other uses such as butchering animals and scraping hides, he said. "They are made in a special way. On the one hand, they are very efficient and on the other, very simple," Barkai said. Working with replicas made from other stones found in the cave, an expert determined that the wear and tear resulting from cutting soft tissues, like meat, matched marks found on the ancient knives. Barkai said that while people have been cutting meat for the last 2 million years, these knives stood out because of their small size and the fact that they were disposable and made from recycled materials. "Such tiny meat-eating knives were never discovered before," he said. Yorke Rowan, an archaeologist from the University of Chicago who was not involved in the dig, said the discovery still leaves a number of questions unanswered, such as why the tools are so small and why the makers would have bothered to recycle materials when they had access to a large supply of flint stones. But the finding is significant, he said, because it shows that materials "that have traditionally been treated as waste might actually be tools." Barkai published the findings in the September issue of Antiquity, a quarterly journal." Yuli Edelstein raises an interesting point. Since no one knows what the borders would be if this round of talks were somehow successful, it seems rather one-sided that only Israel must freeze construction in the disputed territories. After all, the Arabs are building on land that may very well fall within Israel’s borders (assuming these talks led anywhere), in which case the Palestinians are creating facts on the ground and destroying any chance the peace talks could go anywhere. The Prime Minister must demand that Abbas stop all Arab settlement construction and activity, including natural growth, in all disputed areas currently under PLO control for as long as Abbas demands the same from Netanyahu. Apparently one must agree with the Obama Regime in order to get a 501(c)(3) tax exempt status. At least according to someone in the IRS. Z STREET filed for tax-exempt status in January of this year and, despite having met all of the requirements for grant of this status, the application has been stalled. An IRS agent told Z STREET’s lawyers that the application was delayed because of a Special Israel Policy that requires greater scrutiny of organizations which have to do with Israel, in part to determine whether they espouse positions on Israel contrary to those of the current Administration. The lawsuit, Z STREET v. Shulman, Commissioner of Internal Revenue, was filed today in the United States District Court for the Eastern District of Pennsylvania. J-Street on the other hand had no problem getting it. By the way, it is illegal for a 501(c)(3) to endorse a political candidate. That's why J-Street created three "separate" legal entities in the same J-Street family (and office), so they can get around that little problem by claiming each division to be legally independent. J Street is itself a 501(c)(4) non-profit corporation, and a registered lobbying organization, which uses online organizing, advocacy, and education to achieve its goals on Capitol Hill and with the Executive Branch. JStreetPAC is a legally independent political action committee and is the first PAC specifically established to endorse and raise money for candidates for federal office who support active American leadership to bring peace and security to Israel and the Middle East. In its first year, JStreetPAC raised nearly $600,000 for its 42 endorsed candidates for U.S. Congress, 34 of whom won their races. J Street Education Fund, Inc. is a 501(c)(3) charitable organization. It aims to educate targeted communities about the need for a two-state solution to the Israeli-Palestinian conflict, raise the visibility of a mainstream pro-Israel, pro-peace presence within the American Jewish community, and promote open, dynamic and spirited conversation about how to best advance the interests and future of a democratic, Jewish Israel. J Street Local, J Street’s national field program and J Street U, J Street’s on campus movement are programs of the J Street Education Fund. Do you think they're doing a good job keeping their departments separate on anything but paper? I'm sure they're very smart about keeping things looking separate on paper, and that's probably where it counts the most. But we're talking Z Street in this post, not J Street. I simply find it strange that non-profits dealing specifically with Israel undergo extra scrutiny, and can be denied tax exempt status by having a policy that disagrees with the current Regimes. Way back when I was in College, I went to a relatively non-politicized university, but it was always easy to tell who was politically right, and who was politically left. Those who kept their political views to themselves were presumably right, while those on the left made it openly clear what their views were, and often enough your grades were a reflection of how closely you toed their line. I was young and naïve at the time, and didn’t understand how significant and dangerous this was. With one professor, a few of us decided as a joke (and an experiment) to hand to hand in a series of essays that were very similar enough in content and subject. Some reports were accurate, factual and politically neutral, while others modified the facts and conclusions to match this professor’s worldview. You can guess which reports got the A’s, and which ones didn’t. I had another professor that regularly started spouting leftwing political nonsense in class and essentially dared anyone to disagree with her. At the beginning of the semester I started to make the mistake of raising my hand to point out her errors in economics and politics when the looks of everyone around me made it clear that silence was going to be a virtue in this class. There are those that espouse that professors can say what they want and it’s about Academic Freedom, and creating a safe intellectual environment. But college campuses are not safe intellectual environments. If you dare disagree with a left-wing professor in your political science or history courses, your grades might well reflect that mistake (of disagreeing with them). That was true then, and is very true now, particularly in Israel. This is academic terror. This stifles academic freedom and intellectual honesty. If I had known then what I understand now, I would have reported this treatment. But this wasn’t considered a burning issue back then (as far as I knew). Last week I was embarrassed by what I read in the papers. I read that Im Tirtzu threatened Ben-Gurion University, that if they don’t fire some of their professors, Im Tirtzu is going to go to BGU’s donors and tell them all about the University's political bias. This message that they said BGU should fire the teachers was making the rounds everywhere (Ha'aretz to their credit, was the exception, and actually did not say Im Tirtzu said BGU should fire their staff). From what was reported in the papers, it sounded like Im Tirtzu got a little full of themselves and decided to flex muscles they don’t really have. 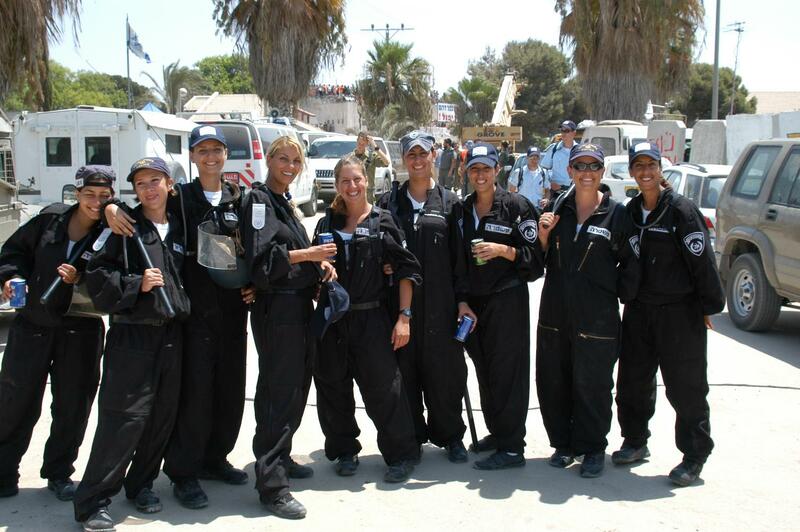 Im Tirtzu did not look good. But, I also knew that if I waited just a bit, something is going to come out that will make this all make sense. Before Im Tirtzu became famous and put the spotlight on Naomi Chazan and the New Israel Fund they were involved in another interesting project. They researched and rated teachers at various universities based on student reports and curriculum material (what textbooks each class required). They published reports on which teachers were post/anti-Zionists and which aren’t. (For "anti-Zionist", they only took the most extreme definition, so there wouldn't be questions about borderline anti-Zionist, or LW "Zionists"). A similar study was also done by an independent research organization. Leftwing professors are calling this McCarthyism and a threat to Academic Freedom. But as someone who experienced their kind of Academic Freedom, I could only wish I had had this report available in my college days. So let’s get back to the facts that Makor Rishon published in this weekend’s paper. The first is that Im Tirtzu did not tell BGU to fire its professors. 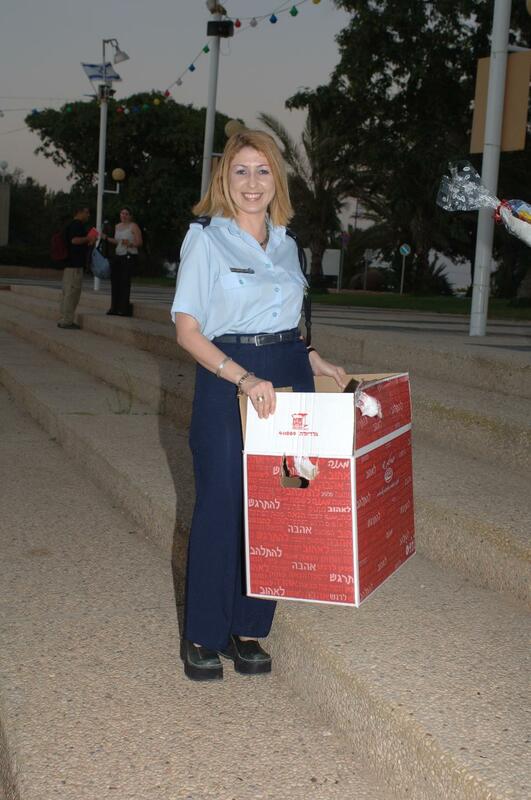 Im Tirtzu said that BGU needs to “put an end to the Anti-Zionist tilt” in its classrooms. If BGU didn’t end the open anti-Zionist agitation in the classrooms, then they would expose this incitement to BGU’s donors. But what “anti-Zionist tilt” was Im Tirtzu talking about, and who were they talking about? Well it seems that at BGU, 9 out of it’s 11 professors in the Political Science department openly express anti-Zionist opinions in the classroom, are members of radical-left organizations, and the department head, Neve Gordon, has called for (wait for it...) a full economic, cultural and academic boycott against the State of Israel. If that was all of it, you could always just write it off as typical leftwing academia and nonsense. But that isn’t all there is. You're probably saying to yourself, if we’re writing about this and Im Tirtzu is involved, then how are we going to bring the New Israel Fund into the picture here. Hold on to your seats, because this is going to blow you away. Ben Gurion University offers a course called “Societal Change in the Periphery”. Ben Gurion University receives NIS 7,300 for each student that attends this course from… the New Israel Fund. But the connection hardly ends there. By taking the course, the students must also volunteer/intern in one of the various “societal change” organizations on the BGU list. BGU gives course additional course credits to the students who volunteer in these various organizations (commonly known as the Easy A). But some (most?) of these social change organizations (always LW of course), while claiming to be involved in social issues, have also been involved in radical left political issues such as trying to get arrest warrants against General Doron Almog and calling for senior IDF officers to be brought to international trial. But it gets better (you're probably asking yourself, “How much more can their be?”, and won’t you be surprised). You get one guess who funds these organizations. 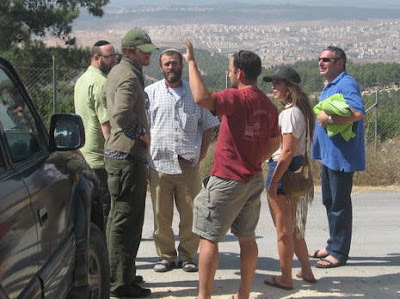 It turns out that all these organizations on the BGU intern list for this program receive NIF funding and are connected to the NIF’s activist arm Shatil. Some of these organizations that receive NIF funding, that students who take the “Societal Change in the Periphery” course are required to volunteer/intern in, and that BGU receive NIS 7300 per student for... these organizations are currently (or were, in one case) headed up by professors and lecturers at BGU, such as Neve Gordon (that name again) who ran “Physicians for Human Rights” and Haim Yakobi (who teaches the “Societal Change in the Periphery” course) who heads up “Bimkom”, and Yishai Menuchin who heads up “The public committee against torture”. Getting back to the start of the post, it seems that the NIF has it claws deep inside the BGU Political Science department. One can only imagine the brainwashing and academic terror that happens when 9 out of the 11 political science professors have radical leftwing outlooks that they aren’t afraid to share. I am sure that Im Tirtzu will be good at convincing BGU’s donors that a donation to BGU hurts the Zionist cause, because they have enough materials and studies to prove it. But I also wonder if there is another way. Every week we learn more and more about how the NIF works and how they use their connections and funding. For instance, last week a picture was publicized with Supreme Court Dorit Beinisch participating at an NIF event two years ago when they received a $20 million dollar grant from the Ford Foundation. 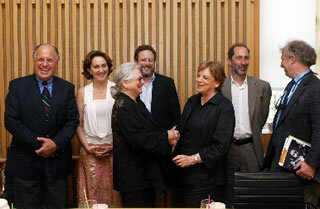 Presidential Summit: Justice Dorit Beinisch (center right), President of Israel’s Supreme Court, meets with Ford Foundation President Susan Berresford (center left). In the back row from left to right are Israel Executive Director Eliezer Yaari; NIF Board VP in Israel Neta Ziv; Ford Foundation Deputy Vice President, Program Management David Chiel; Ford Israel Fund Director Aaron Back; and NIF CEO Larry Garber. Maybe it’s time we on the right learn from the NIF. Maybe it’s time for organizations on the right to duplicate the activities of the NIF. 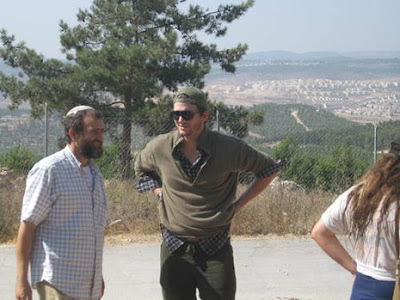 Openly funding courses and professors who express and teach Zionism and love for Israel. Training and supporting the next generation of lawyers, judges, and prosecutors with a Zionist and Jewish perspective. Funding, training and support for activist organizations. Particularly the small one or two person organizations. Enough NIF activities and methodologies have been exposed (and continue to be exposed) that can be copied by a True Israel Fund and then we can fight fire with fire, instead of with just spilling buckets of water on various hot-spots. Obviously, it will be more difficult without the millions of dollars that come in from foreign governments who want to influence Israel from within, but there are still rich Zionist Jews out there who could match at least some of this massive foreign funding. This is a fight over the long haul, and if we also don't start actively influencing the next generation in the schools and in the field instead of always playing defense, then we're fighting a losing battle. On Friday afternoon, outside the Rami Levy in Gush Etzion, emergency responders (IDF, police, and ambulances) arrived in full force after rival Arab clans attacked one another, and the Israelis who got in the way. 2 Israelis (including 1 policeman), and 6 Arabs (including the attendant at the local Gas station) were evacuated to hospitals. Rami Levy is supposed to be a symbol of coexistence in Gush Etzion, but it looks like this symbol just wasn't enough to maintain the fragile coexistence that exists in "Palestinian" Arab society which is actually a conglomeration of often rival Hamulot (clans). It is not clear what this means for the Rami Levy store, but I am sure security is going to be beefed up until Ramadan is over. They are hung from trees by metal chains attached to their arms and provided with plastic bags to collect their urine to drink when they are thirsty. They are gang raped, tortured with electricity and held prisoner in desert camps. When they escape they are shot, either by their Beduin captors or by Egyptian police. These savage and disturbing details, published piecemeal over the years, are just a part of the picture of what is being done in Egypt's Sinai desert to African migrants. Apparently this isn't worth anyone's attention, since there's no way to blame Jews for it. 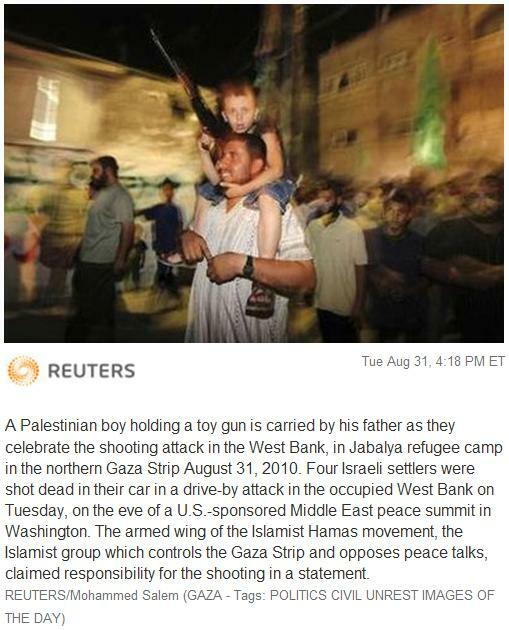 And you won't hear the EU or the UN saying anything about this either, let alone issue any condemnations. They're too busy with much more important things, like investigating the Israeli raid on the terror flotilla, and demonizing Israel for the shortage of coriander in the Gaza Luxury Mall. This story is simply amazing. For over 60 years, Palestinians living in Lebanon had no rights and existed in sub-human conditions. The world of course, blamed Israel. Israel's Deputy Foreign Minister, Danny Ayalon wrote about this a few weeks ago in the Wall Street Journal. Surprisingly, just a couple of weeks after Ayalon's op-ed, the Lebanese government changed their status! The Lebanese parliament voted on Tuesday to grant the country’s 400,000 Palestinian refugees the right to work in the same professions as other foreigners, lifting a decades-old ban that had relegated the refugees to the most menial jobs. The bill was intended to transform Lebanese policies toward the refugees, although Palestinian leaders in Lebanon and human rights workers say it was only a first step that leaves significant stumbling blocks in place. The Palestinians living in Lebanon are isolated from the rest of the country in refugee camps to a higher degree than anywhere else in the Arab world. “I was born in Lebanon and I have never known Palestine,” said Ahmed al- Mehdawi, 45, a taxi driver who lives in the Ein el- Hilweh refugee camp, which is notorious for its lawlessness. Why is it that real human rights abuses in the Middle East go on for decades, while the left and anti-Zionists bash Israel? Why does it take a member of the Israeli government to expose this, while all the "Human Rights" fundamentalists ignore it? The obvious answer: none of the organizations and countries who routinely bash Israel care about Human Rights...they just care about bashing Israel. 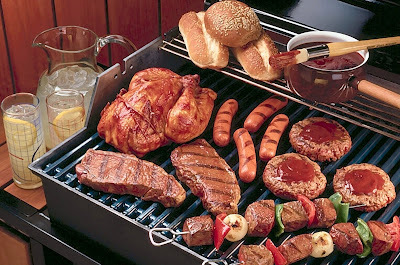 Is artificial meat simply meat that is grown, based on existing meat? Would the original piece of meat need to be have come from a Kosher animal that was slaughtered in accordance with Jewish law, and then all meat "grown" from it, would be considered Kosher? 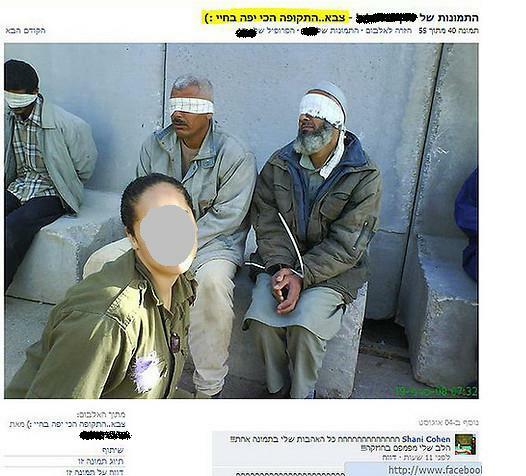 Eden, the ex-soldier from Ashdod who posted photos from her time in the IDF posing next to cuffed Palestinian detainees on her Facebook page is shocked by the backlash the incident prompted. "I received death threats from all over the world on Facebook," she told Ynet. "I'm sorry if anyone got offended, I actually took care of the detainees. The IDF has let me down profoundly. I wish I never served in such an army." 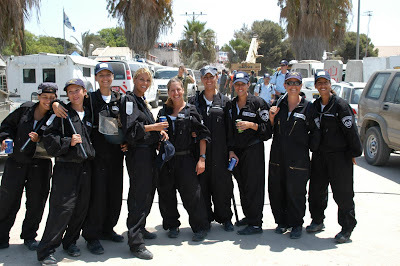 Eden shouldn't have posted her photos from her IDF tour of service on facebook -- that was rather stupid. To her credit, she wasn't smiling in the photos. 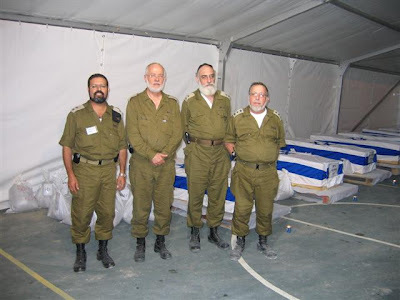 Of course, the real hypocrisy is that there was zero outrage in Israel when the following IDF soldiers and Israeli policemen took photos of themselves smiling, grinning and laughing, as they evicted thousands of Jews from their homes in Gaza, destroyed their homes, and dug up the graves of buried Israelis (smiling in front of the coffins). All the following photos are from the Gush Katif memorial web-page which documented the expulsion. Israeli policemen pose in a home to be destroyed. The IDF Spokesman's Unit issued a statement in response to the incident describing the ex-soldier's behavior as shameful. 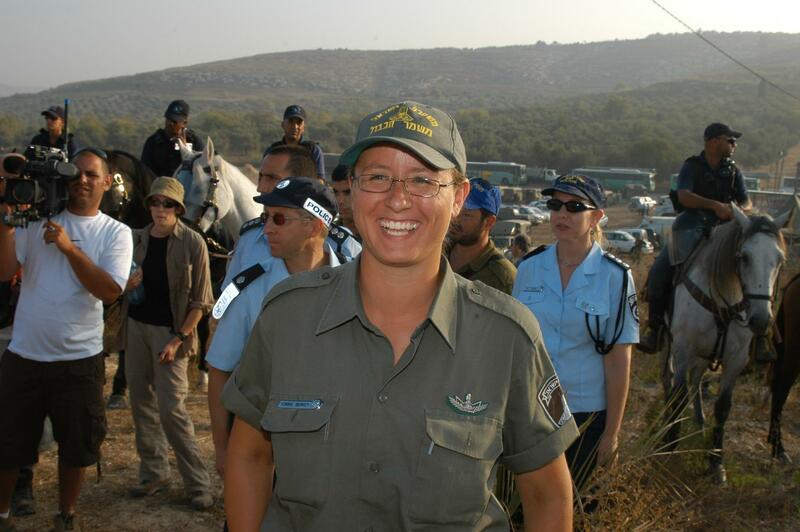 Eden claimed that she was told by the IDF she will not be called for reserve duty and will be stripped of her ranks. "I'm very disappointed with the IDF, the army is ungrateful. I risked my life, got injured, I was a model soldier, and now I wish I never served in this army." 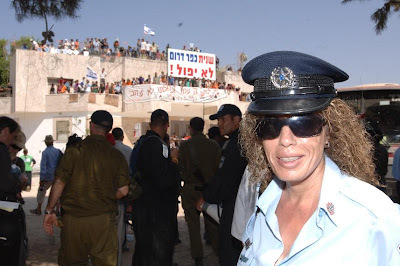 She explained the IDF's response by saying that "the army is making the soldiers look bad and the country look great so that Obama won't get pissed off. As far as I'm concerned we're not even an independent state, people are afraid of just pictures. I'm sorry this is the way my country is." The IDF spokesman's unit didn't say the photos above were shameful...so it's perfectly understandable why Eden thought it was ok posting her photos to facebook. Here's some more video footage of the over-joyed soldiers and policemen who were responsible for the expulsion from Gush Katif. The infamous sock dance of the grave expulsion unit. 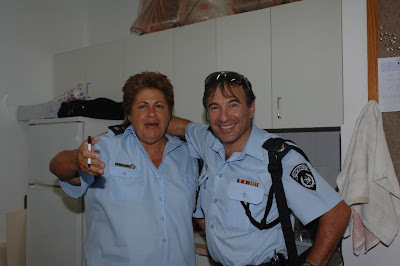 The infamous and vulgar Police Officer explaining how to expell and arrest Jews. And here's the heart-wrenching video of the residents prior to their eviction. The government is proposing a bill. It's a simple bill. Israeli NGOs will be required to report how much funding they receive from foreign governments, or from sources that are primarily funded by foreign governments. It won't stop them from receiving the money. Just expose it. The bill is a response to the Goldstone incident, where foreign interests and foreign governments (who do not have Israel's best interest at heart) helped fund Israeli Leftwing NGO's reports and research against Israel. The NIF and other leftist groups are fighting this tooth and nail. Radical leftist groups are calling this bill "McCarthyist". It just doesn't sit well with me. On one hand here we have the NIF running a campaign call "We won't shut our mouths", saying they won't be shut up. They say they are all for transparency. But when it comes to actually putting their money where their mouth is, suddenly they don't want to sing. And they've got it all wrong anyway. 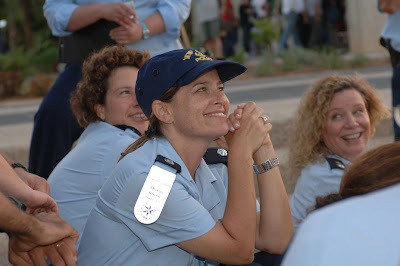 Im Tirtzu and concerned citizens of Israel DON'T want the NIF to shut up. We don't want the NIF to be quiet. We want them to, quite loudly, tell the country about all their activities, all the activities they are funding, and who is giving them the money to run those activities. For years, the NIF slipped under the wire of public consciousness. But when the public became aware of the NIF and many of the activities they are running and funding the public became outraged. So NIF, please don't shut your mouth. The greatest threat to the activities of the NIF is public exposure of those activities and funding sources. USA and Turkey: The Odd Couple. See if you can keep up with these zigzags. Kudos to US President Obama for this bold move. 2. Israel continues selling weapons to Turkey, despite Turkey's ongoing antagonism towards Israel, banning Israeli warplanes from using Turkish airspace, etc. Why does the US have the guts to do what Israel does not? The JPost reported a few weeks ago, that Israel is still selling military equipment to Turkey, and is sending 4 unmanned surveillance drones to Turkey. So the USA is a better friend of Israel than Israel is to itself? 3. Question: Where are 90% of the engines for the USA's F-35 advanced tactical fighter jet, manufactured and assembled? Turkish Foreign Trade Minister Zafer Caglayan said that Turkey's defense contractor KaleKalip will start manufacturing F135 engines for F-35 Joint Strike Fighters along with Sikorsky helicopters under license from the United States' United Technologies Corporation, the Star Gazetesi reported Wednesday. Caglayan told reporters about his meeting last week with UTC executives aboard a plane en route to Turkey from the United States, noting that UTC's discussions with KaleKalip began last week, adding, "They will sign a deal next week." KaleKalip initially will produce 90 percent of F135 engines' components for the F-35 aircraft and eventually will manufacture the entire engine. 4. Question: Who announced they are now buying a squadron of 20 F-35s for the cost of 2.7 billion dollars? The F-35 warplanes are expected to be delivered between 2015 to 2017, an Israeli defense official said. Israeli leaders have spoken of arch-foe Iran potentially developing a nuclear weapon by mid-decade, suggesting that the F-35s would not be used for any preventive action, but rather to bolster the country's deterrence. A ministry statement said Barak "approved in principle the recommendations of the Israel Defense Forces and the Defense Ministry to move ahead" with the purchase. Will the US find itself in a strange position that while supporting their strategic ally, Israel, they will be preventing weapons from going to Turkey...and perhaps even face delivery and engine manufacturing issues for their F-35? The PA is announcing a new initiative for PA residents to use Palestinian medical services and hospitals, and not use Israeli health care. Minister Fathi Abu Moghli told Ma'an radio that referrals would stop "because our hospitals can cover all medical services qualitatively." Certain patients will still require treatment abroad, he said, but the majority can be treated locally. "We endeavor to reduce the cases which need referral abroad as long as they can receive adequate treatment locally," the PA minister said, adding that between 2008 and 2009, the number of patients being treated abroad was reduced by 50 percent. "Referrals for treatment abroad is kind of a culture imposed by the Israeli occupation after 1967 when the Palestinian health system was made dependent on the Israeli system. Even the PA failed to change this culture and officials enhanced it by using their influence to help certain patients get referrals for treatment in Israel," Abu Moghli added. Last week I was called to a road accident in my capacity as a medic, and I saw Palestinian motorists begging Magen David Adom ambulances to take their severely wounded children to Israeli hospitals, yet the Palestinian Red Crescent ambulance crews said they would take the wounded to a Palestinian hospital in Shechem. 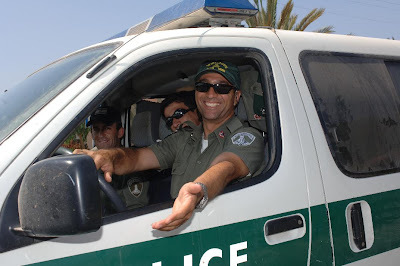 I was at an accident where PA policeman made an illegal U-turn in the middle of a highway, and caused an immediate fatal collision with another Palestinian car, resulting in 3 Palestinian deaths, and the PA policemen were severely wounded. They also begged to be taken to Israeli hospitals, and due to being "PA police", they were even transported to Israel for treatment. If the PA is so insistent, let them use Palestinian hospitals -- it's not like Palestinian terrorists show any goodwill to Israel for healing cancer stricken Palestinian children. 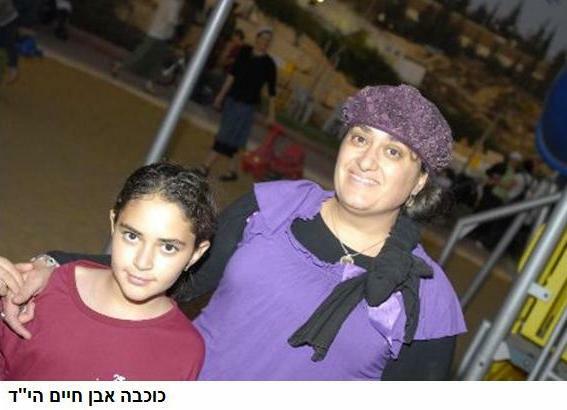 Just a few weeks ago, we learned how only 2 weeks after an Israeli NGO financed cancer treatment at Hadassah Hospital for a Palestinian child, the child's father was involved in planning and executing a terror attack against Israelis, killing an Israeli policeman. 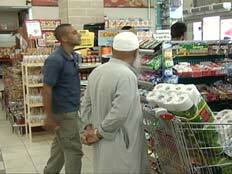 "The level of knowledge we had on the [IHH] was not like the level of information we have on Hamas. We did not investigate the organization. It was not on our list of our priorities, because it was not listed as a terrorist organization and was located in Turkey, which is not an enemy state -- and I hope it never will be." Incredibly, even after hearing all the rabid, extremist diatribes against Israel spewed forth on an almost daily basis by Turkish Prime Minister Recep Tayyip Erdogan, and even after watching Turkey openly forge alliances with Iran, Syria, and Hizbullah, Ashkenazi -- and the Israeli government -- still have not grasped the simple and obvious fact that Turkey has become our enemy. Israel, meanwhile, is actually continuing to sell advanced weapons systems to the Turkish military, and to train them in their use. One wonders why Israel doesn't simply eliminate the middleman, and just ship weapons directly to Hizbullah. Poor PM Erdogan must be extremely perplexed and frustrated: He has done just about everything feasible within his power to demonstate clearly that he is a bona fide, full-fledged, fierce enemy of Israel: He has viciously denounced Israel as a criminal, terrorist state on every possible occasion, he has sent a ship filled with armed men who attempted to murder Israeli soldiers, and now he is supplying Hizbullah with guns and rockets. Yet with all this, Israel still stubbornly refuses to recognize him as an enemy. Erdogan must be banging his head against the wall, wondering what else he can possibly do to get the message across to those incredibly dense Israelis. It is the New Year's Day for Animals. The 1st of Nisan is the New Year's Day for dating the reigns of kings, and for caclulating the cycles of festivals. The 1st of Tishrei is the New Year's Day for calculating calendrical years, shemitot (sabbatical years), and yovelot (jubilee years), as well as for planting (with regard to the law of orla), and for the ma'aser (tithing) of vegetables. The 15th of Shevat is the New Year's Day for the ma'aser of (fruit) trees. The 1st of Elul (today) is the New Year's Day for the ma'aser of animals. On the New Year's Day for the tithing of fruit trees -- commonly referred to as Tu B'Shevat -- it is customary to celebrate by eating fruits grown in the Land of Israel. And thus, in the exact same way, it is certainly most fitting to celebrate the New Year's Day for the tithing of animals -- today -- by eating meat grown in the land of Israel. So happy New Year's Day! Therefore, those who wish to be cautious and stringent, and are careful to follow all opinions, should make it a point to do barbecues on both the 1st of Elul and the 1st of Tishrei.